Outside of individual’s holding oil stocks, damage to the economy from the fall in oil has been pretty minimal so far. Indeed, the price cut in home heating oil and gasoline has probably outweighed the damage from lower oil prices… so far. Unfortunately, this situation may not last. Analysts are starting to look beyond the boost to the economy from low oil prices and see the damage that is being done by worker layoffs, slowing business, and falling home prices in oil producing states. Indeed, one recent estimate suggested that up to four jobs could ultimately disappear for every one job lost in the oil sector. There is little doubt that as oil prices fall, some people working in that sector will lose their jobs. 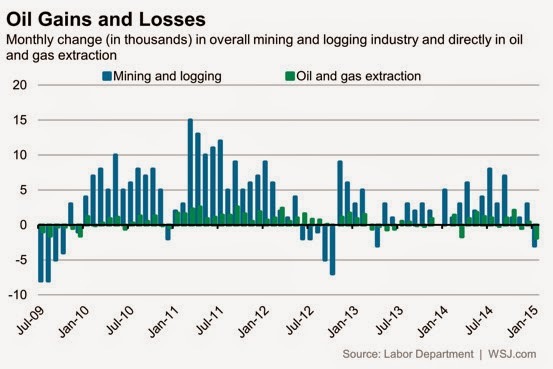 What is less clear is the impact those job losses will have on other sectors of the economy. Since one person’s spending is another person’s income, as people lose their jobs in the oil patch, that should mean less spending at the local grocery store, restaurants, etc. Now of course, this fall in spending is partially offset by a rise in incomes from the fall of gas prices. But that gas price benefit is spread out all across the country, whereas the damage from the fall in oil prices is localized to certain areas with a lot of oil. Overall then, it’s not clear how large the damage will be from oil’s price collapse. But we do have a model to look to in this case: Australia. Australia went through a mining boom over the last fifteen years that created a large new upper middle class. People working in Australian mines worked hard, but earned excellent wages and spent that money liberally. Stories of blue collar people with high school educations earning $200,000 a year and spending that money like water were common. The same thing has started to happen here in the US. Vice President Joe Biden recently extolled the virtues of new middle class jobs that could be created in the energy industry, especially around updating the country’s infrastructure. Over time, if a lot of these types of jobs are created it can have a dramatic effect on an area, as Australia demonstrates. Now though, that cycle is working in reverse. As oil prices have fallen, so too have the profits for oil companies and all the other companies in the oil supply chain. The process has been so fast that the economic damage probably has not been felt yet – almost like being injured and not realizing it due to adrenaline. Here again, Australia provides an economic model, and it looks like the damage in oil producing states could end up being widespread and long-lasting. If the average oil producing metro area has 3% of workers employed in the energy sector and a third of these folks lose their jobs, then that implies an extra 1% of unemployment. That is not bad, but if that 1% of workers are supporting an additional 4% of workers (using the 1:4 rule analysts found), then that would mean a total of 5% in additional unemployment. This could easily lead to 10% unemployment up from a normal 5% rate. That level of unemployment would have a severe long-term effect on house prices, sales tax receipts, economic growth in the area, etc. This is exactly what Australia is experiencing right now. So while the short-term impacts of oil’s decline have not been too bad, it certainly looks like there is more pain to come. Unfortunately, as helpful as the energy sector was in buoying the county during the Recession of 2008, the energy sector may now hold down the economic expansion just as the economy is starting to pick up steam.